When it comes to observational astronomy, scientists and cosmologists have been facing a sort of crisis of late. With so many instruments aimed at the heavens, recording what little information makes it all the way to Earth, simply observing distant stars has been providing diminishing returns. 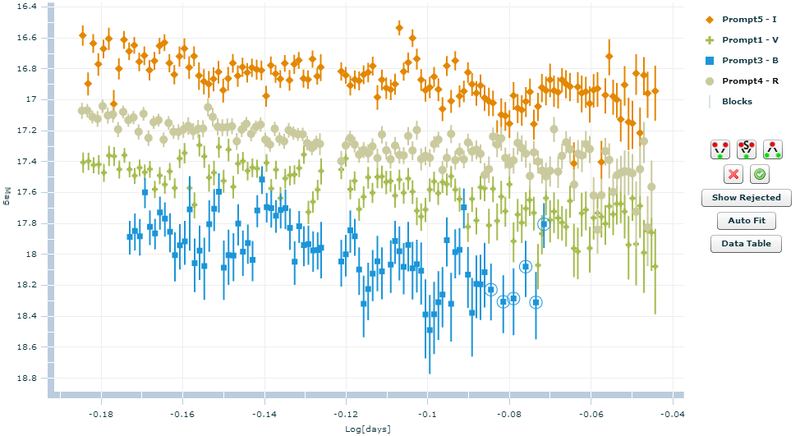 In order to keep moving forward, we must observe the most unusual and, in many cases, violent cosmic events so we can see some truly novel data. This presents a bit of a challenge, since the the space industry can’t possibly set up enough telescopes to look at every part of the night sky all at once. With so much depth through which to zoom, it would seem a lost cause to try to capture unexpected, short-lived events. And yet, one such event, one that is truly cosmic in nature (no pun! ), was captured just recently. 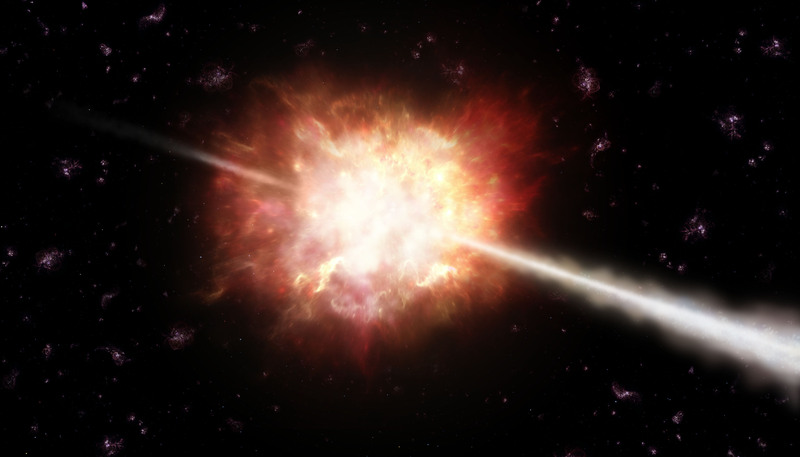 It took place back in late November, when an “armada of instruments” from all over the world saw a massive gamma-ray burst originating from a point in space known as GRB 130427A. This burst was more powerful than what many researchers believed was theoretically possible, and is now thought to be the collapse of a giant star and the birth of a black hole. The event has been described as a “Rosetta stone moment” by astronomers for a number of reasons. In addition to being a truly rare and awesome sight, this burst has also sent out information that astronomers will be studying for many years to come. And while it’s too soon to draw any real conclusions, there is already widespread excitement about the sheer newness of it. And yet, GRB 130427A only lasted about 80 seconds at observable intensities, so the fact that it was observed, letalone documented so thoroughly was truly surprising! This was all thanks to the Los Alamos National Laboratories in New Mexico, where six robotic cameras – collectively referred to as RAPTOR, or RAPid Telescopes for Optical Response – were able to respond in time to catch the event unfold. The RAPTOR telescopes are networked together and all obey a central computer “brain”. Between their dedicated computing hardware and robotic swivel-mounts, they can turn to view any point in the sky in less than three seconds. As the world’s fastest “optical response” devices, RAPTOR’s telescopes are designed to make sure we don’t miss astronomical events when they happens, because in astronomy there are no second chances. The RAPTOR telescopes to ensure things aren’t missed by performing extremely diffuse, wide-angle sweeps of the sky to pick up hints at about where and when a major event is taking place. When one of the telescopes sees a hint of something good, it and the others quickly reorient and zoom to capture it in full detail. And with all six telescopes capturing the same event, the wealth of information gleamed is quite impressive. The telescopes have different specializations as well. For example, the RAPTOR-T views all events through four aligned lenses with four different color filters. By looking at the differences in color distribution in the sample, RAPTOR-T can provide info about the distance to an event (by measuring Red Shift and Blue Shift) or about some elements of its environment. 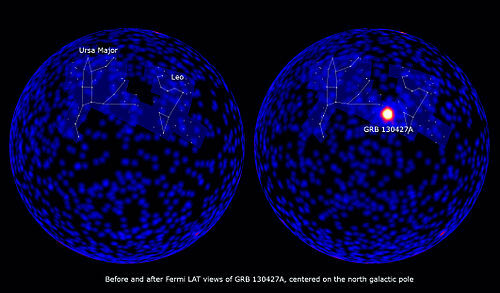 This gamma ray burst is thought to be the brightest in decades, perhaps in a century. And if astronomers had missed it, it’s likely that nobody would have gotten the chance to capture one again. Luckily, the event was also seen by a number of other gamma ray detectors and x-ray telescopes. These included NASA’s Fermi, NuSTAR, and Swift satellites, all of which managed to see some portion of the event as it unfolded. 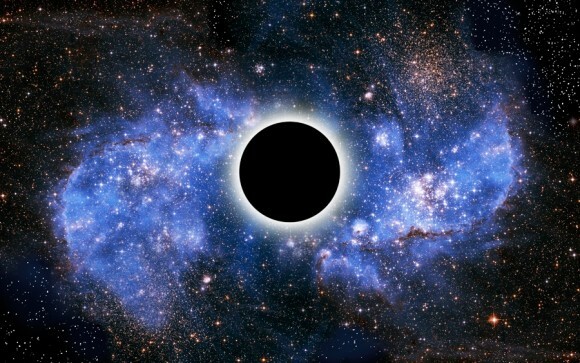 However, most telescopes joined in to view the event’s so-called afterglow, an incredibly violent occurrence where the newly-born black hole threw out debris and damage over a wide radius. For several hours, this radius glowed and astronomers watched as it faded. 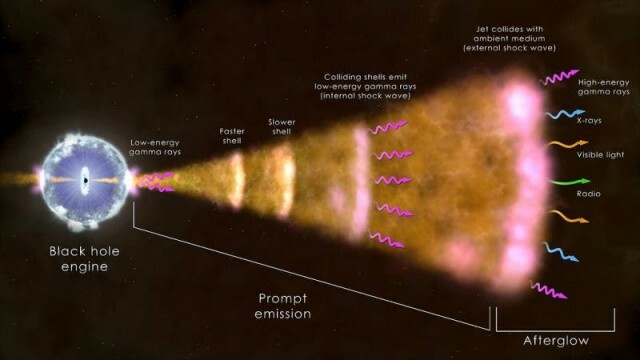 The intensity of high-energy gamma rays in that afterglow faded in tandem with its conventional light emissions. This is one of the first useful bits of information provided by this event – the link between gamma rays and optical phenomena. But this is just one way that it could be astronomy’s latest Rosetta Stone observation. In the next few months, we can all look forward to a slew of exciting updates as astronomers sort through the implications of having witnessed the birth of an unprecedented singularity. I gave your Whiskey Delta to my Walking Dead fan friend. I’m not sure if he has even started it yet, but his wife was halfway through after just two days. Good sign. I told him to go to this page to order the next books so you’ll get the extra kickback from Amazon. Merry Christmas and great New Year. And Merry Christmas and Happy New Year to you too! Sorry, Zomies have never interested me. But I do like networking people with like interests.